Achieve better and more consistent tobacco transplant results with the latest advancement in float tray technology – the Trilogy Tray. The Trilogy Tray is an injection molded plastic float tray made from recyclable material. It is produced to have more consistent characteristics from season to season, and its patent pending design yields a better plant with faster and more consistent germination. Does the Trilogy Tray float level? Yes, your Trilogy Tray will float level if you “place” it in the water correctly. The Trilogy Tray relies on air trapped under the tray to float correctly. This means you have to “place” the Trilogy Tray level in the water. If you place the Trilogy Tray level in the water, it will float level. Will tobacco plants fall out of the Trilogy Tray? A healthy transplant with a good root system will not fall out of the Trilogy Tray. To get the healthiest plants possible, choose a good potting soil mix with large particle size distribution and high air porosity such as Beltwide Gold. Follow up with a good fertility program based on water samples and Coastal’s Impact F Float Bed Program. Tobacco plants will not grow roots into the side of your Trilogy Tray making them easier to remove with less damage to the stems in the setting process. Can I use my current seeding equipment? 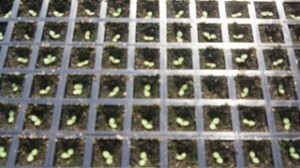 Yes, you can use your current seeding equipment to seed your Trilogy Tray. The depth of the Trilogy Tray is less than that of older Syrofoam (EPS) trays on the market, but is the same depth as the newer Styrofoam trays being sold. You will have to adjust your seeder for a shallower tray whether it is the Trilogy Tray or a new Styrofoam tray. Can I put the Trilogy Tray in the same float bed as the Styrofoam Tray? No, do not mix your Trilogy Tray and Styrofoam tray in the same float bed. The Trilogy Tray is shallower than the “older” styrofoam trays. The Trilogy Tray will float a little lower in the water than the styrofoam tray and will be hard to mow at an even height. The best scenario is to have a whole greenhouse of the same tray. At a bare minimum, have a whole bed of the same tray. How should I store the Trilogy Tray? Your Trilogy Tray can be stored in the same way as the Styrofoam tray, with one exception. Make sure your Trilogy Tray is stored on a flat surface, such as a concrete floor, shipping container, or on pallets. Stacking your Trilogy Tray on a flat surface insures the tray will not warp or bend. The Trilogy Tray does have “memory,” meaning it will return to its true shape, but will have to be placed on a flat surface for that to happen. Can I store the Trilogy Tray in the Greenhouse? Yes, you can store your Trilogy Tray in the greenhouse if you stack them on a flat surface such as a pallet. Heat and sunlight could reduce the life of your Trilogy Tray just as it will reduce the life of a Styrofoam tray. How do I clean the Trilogy Tray? Cleaning your Trilogy Tray is simple. Wash your Trilogy Tray with a high pressure water hose or pressure washer to remove all soil and plant material. This is all the sanitation needed for your Trilogy Tray. Removing all soil and plant debris is adequate to sanitize the Trilogy Tray, even from Tobacco Mosaic Virus. Your Trilogy Tray will not have to be dipped, steamed, or fumigated. Will the Trilogy Tray really last 20 plus years? The Trilogy Tray is new to tobacco greenhouse production, but is not new to other greenhouse industries. The design of the Trilogy Tray has been used in other greenhouse industries with trays lasting for 20+ years. If proper care is taken with your Trilogy Tray, it will last for 20 plus years. How do the Tobacco Companies feel about the Trilogy Tray? Some companies are paying more attention than others. The overall response is positive. Obviously, anything that would remove a source of Styrofoam from a tobacco farm would be favorable to any tobacco company. To visit our Trilogy Tray page, click here.